What an awesome website. We are in the process of remodeling and I was delighted to find your site. You did an outstanding job on your home and it is truly a work of art. What window company did you use? I need to make a decision on the windows above my kitchen sink. Window area is about 8'. I had planned to do double casements, but our contractor suggested casements on the sides and a fixed window in the center....any thoughts? 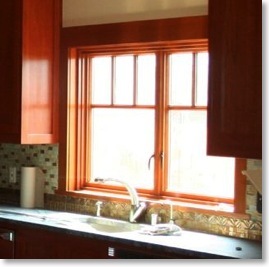 The windows I use are push-out windows from Loewen, a Canadian company. I absolutely love these windows and everyone that sees them always asks who makes them. Nobody ever heard of Loewen but I have created many converts. When the double windows are pushed fully open, there is no middle support so it is a large 5-foot wide opening. When the windows are open there are locks at the top and bottom of the window where it attaches to the frame. When you push those buttons in, the whole window can slide over on its track. This allows you to clean the outside part of the window from inside without having to go outside with a ladder. The exterior is aluminum clad with a douglas fir interior. All windows are double paned and each light in the window looks like it is an individual, separate light but it is not. The window contains one piece of glass for each pane thereby increasing its efficiency. Also, the screen is inside the window on its own door which adds a nice elegant touch. Now to your question about what you should do in front of your kitchen sink. That's a tough one but due to the 8 foot width, I would lean towards your contractor's idea of keeping the middle pane fixed. The fact is that you probably wouldn't be able to reach it that well anyway with the sink and faucet right in front of it. For my kitchen I ended up having to get rid of the screens because they would be in the way (over the counter) when open and I wouldn't be able to push the windows open unless I opened the screen first. You can see the window in my kitchen pictures.